If your wallet gets soaked, you can dry it out and probably salvage most of what was in it. It's not the same with your computer system. Backing up your data is as important as anything you do on your computer. In fact, you could say it's more important than any one thing, because unless you back up, you will likely lose everything! Back up as frequently as you can afford to lose data. If your volume is so great you can't afford to reenter a half-day's work, you must back up twice a day. On Monday, back up to A; Tuesday to B; Wednesday to C; Thursday back to A; and so on. 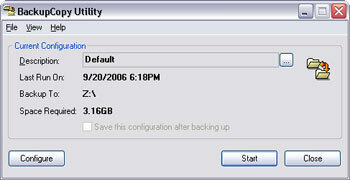 In this way, if you back up corrupted data, you will have an alternative, even if it's older than you might like. At least once a week, make a backup you can take off-site. We have tools for our customers to make backing up as easy as possible. All of our applications have internal backup routines. You just press Ctrl+B from the main application window, or select Tools>Backup, and you'll see a window like this. This is absolutely the easiest way to back up the applications current database. The first time you use it, you'll want to click Browse and select a target drive and location for the backup. (See Backup Media below.) 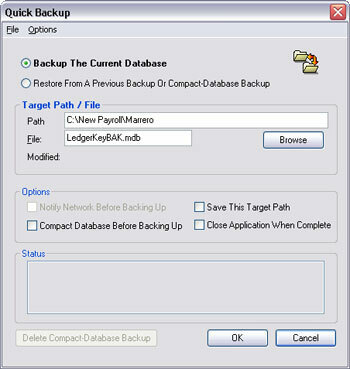 Check Save This Target Path, and next time you select this Quick Backup, the application will "remember" the target location. In fact, all you normally have to do to create a Quick Backup is press Ctrl+B and Enter! Depending on the size of your database (and to a lesser degree, the backup media), this Quick Backup normally takes between five and fifteen seconds. the only complication is that if your database is on a network, other users have must not access the database during the few seconds the backup is taking place. Simply backing up -- any backup -- eliminates 90% of the risk for "losing data". However, you're not really secure unless you make a backup you can take off-system, even off-site. We've created our own little utility that makes an off-system backup as easy as one click. When you launch our BCU, you'll see a window like this. Normally, making a complete duplicate of your work that you can take home with you is as easy as launching the BCU and pressing Enter! Optical disks (CD-ROM's) are not a reliable backup medium! Many computer manufacturers include "CD burners" in their systems because buyers know they need a backup medium, and these drives are an inexpensive "solution". The problem is that this -R and -RW technology is simply not reliable. We have seen failure rates approaching 20%, and that's just too great a risk to take with your data. After all, the whole point of backing up is to secure your data. USB flash drives are a new alternative. These are tiny (about the size of a stick chewing-gum pack) and plug directly into the computer's USB port. Since they have no moving parts, they are potentially more reliable that ZIP or hard drives -- though their small size may encourage abuse, such as getting them wet, and they may not survive that. Also, they offer the advantage of portability from machine to machine without any common hardware other than the USB port. You'll need USB-2 (versions 1 and 1.1 are probably too slow), and their cost per character saved has come down to less than ZIP drives. Our recommendation: 2GB USB flash drives. SanDisk® and Lexar® are preferred manufacturers. Click here for some important information about unplugging USB drives.